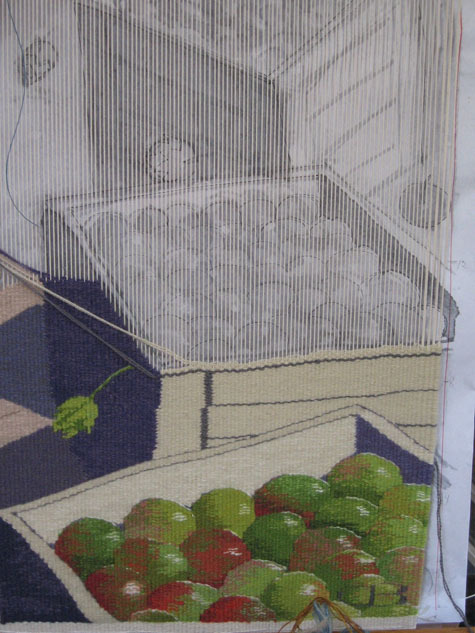 I have just started work on a newly commissioned tapestry that will keep me busy until late spring or early summer of 2010, so this is a good time for me to write about the commission process. I am almost finished with the first foot of a 6.5’ x 6.5’ tapestry for an elementary school in Moxee, near Yakima, Washington. 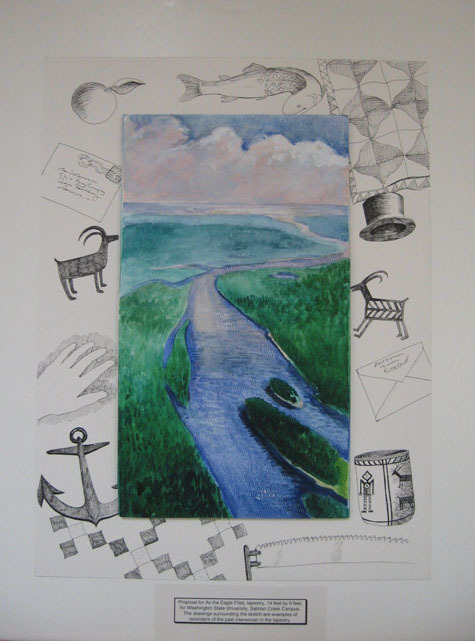 The image is playful and alludes to the local landscape and history. Luck has definitely played a part in my getting commissions. While I was still in art school I was asked to weave a tapestry of a grayscale painting done by an acquaintance. The result was close to what she originally imagined, and that gave me confidence that I could tackle someone else’s images, as well as my own. Some of my work is based on my photographs and this kind of work requires a certain exactness when translating into tapestry. The experience working with another artist’s design gave me confidence that I had those skills. Shortly after moving to Eugene, Oregon, from Sweden, I met an architect who was designing a French restaurant in which she wanted to hang one of my tapestries, The Pioneers, a scene with a group at a table. This exposure, plus having a local show of my work, led to two commissions: a small diptych for a bank and a large commission for a church. I don’t have a formula for getting commissions. If I did I would be busy all the time. But there are common factors that make for successful commissions. One is to keep the client happy. That doesn’t mean giving up what you want to do. It means being open to ideas and staying in communication so that everyone has a common understanding before the contract is signed and the weaving has begun. The second factor is to deliver what you promise and do it on time. 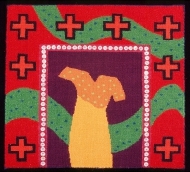 Make sure the client knows that tapestry is not printed at Kinko’s or woven on a machine. 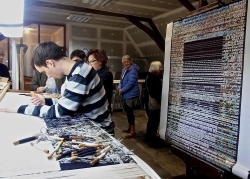 This is partly what makes tapestry valuable, long lasting and precious (which doesn’t imply anything about the image!). 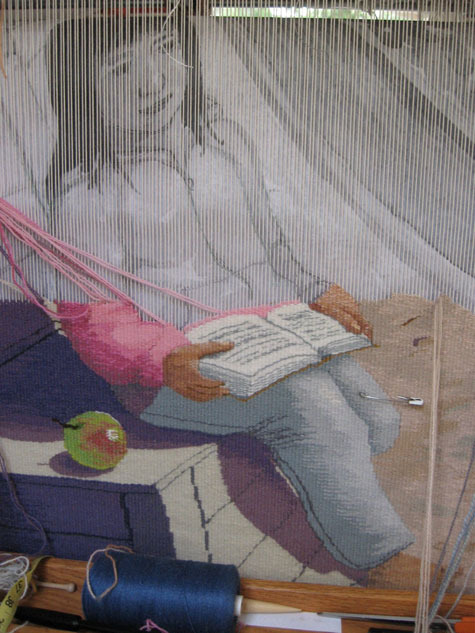 Tapestry is created by your hands, your eyes and your skill. So, how do I get commissions? There are several websites for art projects, and occasionally I send images to promising projects, most often unsuccessfully. Also, states, counties and cities have art committees searching for work, sometimes existing, and sometimes commissions. I have been most lucky in being included in the Washington State Art in Public Places slide bank. My advice is to submit your best work to slide banks or posted projects. Or spread the word that you’re interested in doing commissions. It’s good practice to do smaller works for friends, too. Get used to rejections, but don’t get discouraged! 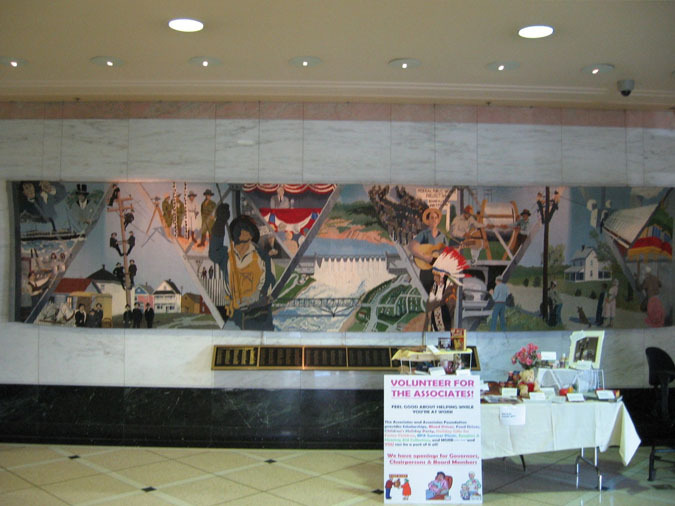 Since many of my commissions have been through the Art in Public Places program at the Washington State Arts Commission (WSAC), I will describe their process. In order to be eligible for these projects, you must be accepted into the slide bank. This is a juried process. The images in the slide bank are shown to art selection committees from project sites and the committee selects an artist from that group. The artist is notified of the project location and budget and meets with the art selection committee in order to give a brief presentation of her own work and previous projects. 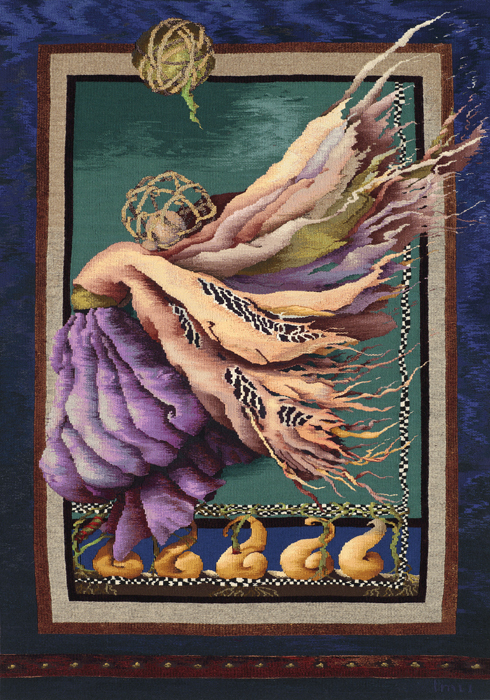 I usually prepare a Power Point presentation about my work and I bring a couple of tapestries so that the committee can see and touch a real tapestry. This meeting will also include a conversation about the project, a look at architectural plans, or, if possible, the actual space for the intended work. 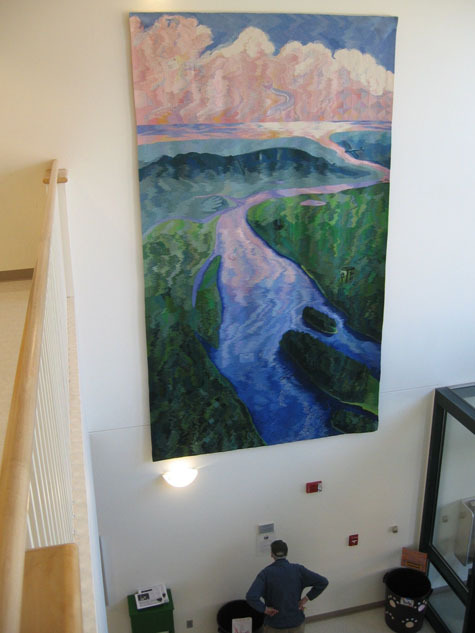 With WSAC projects, it is usually up to the artist to select the site within the building for the artwork, if there are multiple sites available. When I meet with the committee, or client, I try to get a feel for what they have in mind. WSAC clearly states that it is up to the artist to come up with the design. 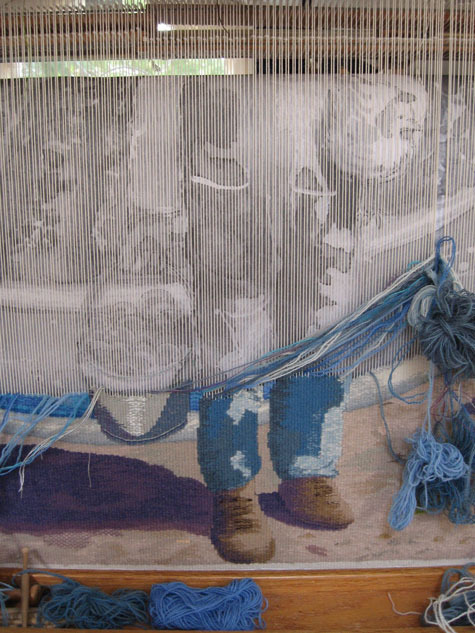 Each artist works differently, but I like the interaction with, and input from, the people who will live with the tapestry. I try to incorporate something of the local history, nature, locales, etc. in the piece. 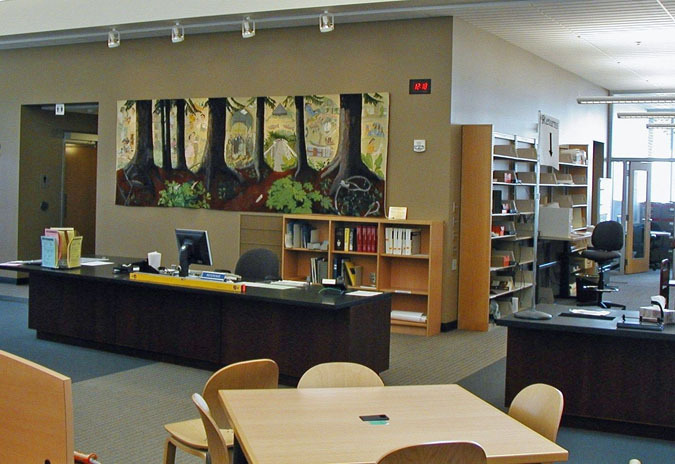 Libraries and museums in the area are great resources and I also take lots of photos on my visits. Back in the studio I start sketching ideas and try to capture first impressions. I read or scan all sorts of material, whether I think they will be useful or not. I’ve found that there are usually lots of triggers for ideas, and I finally have to limit myself and see what works in a composition that will fit the site. Sometimes an idea strikes like lightening, and other times it evolves through sketching and sleeping on it. My first proposal usually consists of a fairly complete sketch (or two), yarn samples and/or a woven sample, and a site drawing to scale. I also include mounting description and information on the yarns I will use. The presentation of the proposal is the first time the art selection committee will see the specific ideas. I always sense their excitement, as well as their wariness. My enthusiasm about the project is essential, as it has an impact on the client. I explain how I’ve come up with the idea, why I like it, and why I think it will work in the space. Sometimes I barely have to speak for my proposal. The piece will speak for itself and the client will love it. Sometimes the committee points out factual or visual changes that would improve the piece. The following is an example of suggestions made by a client. 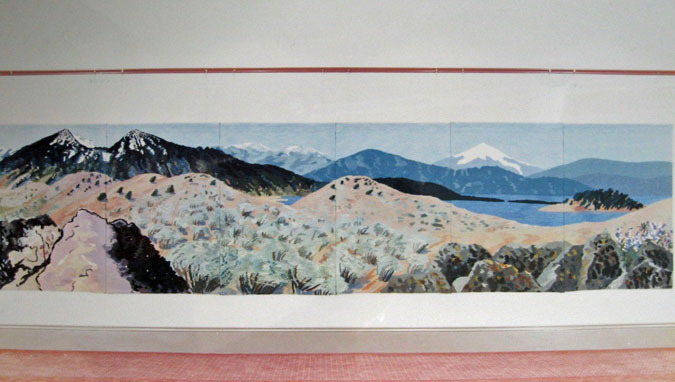 Twenty years ago I presented a proposal to the Bonneville Power Administration for a 5’ x 24’ tapestry about the history of public power in the Northwest. My sketch toured all of the BPA offices, and word came back from the engineers that I had erred in the placement of bolts on the girders that I had used as visual dividers in the image. They also wanted me to include images of the aluminum industry and eliminate those of the nuclear cooling tower. I moved the bolts and put the aluminum smelter where the cooling tower was, but I still included the tower because, as I explained to them, it was an important part of their history. They also wanted me to remove the pink rolls of insulation in the corner of the piece, something that represented the Northwest’s commitment to conservation. I gently refused, arguing that the rolls matched the pink of the house in the left corner of the tapestry. When it makes sense to make changes, I do. Otherwise, I don’t. If all goes well, the sketch is approved and the contract signed. The committee in Moxee approved my initial sketch, which meant that I did not need to do a final sketch and woven sample for the commission, which is normally part of the process. 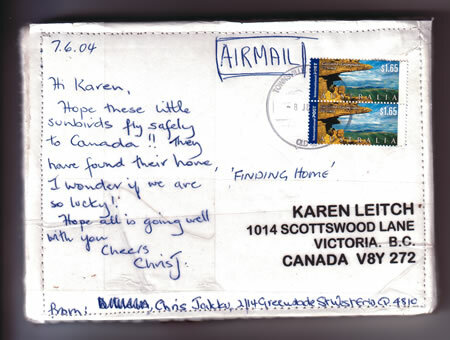 This saved time, and of course I was happy that they loved the sketch. To produce the cartoon for the project I had the sketch enlarged to a full-sized grayscale photocopy at Kinko’s. After the design is accepted, a timeline that fits with the client’s schedule is agreed upon and the next step is to calculate how much I need to weave each day, week and month to meet that timeline. I make a chart and measure progress weekly. 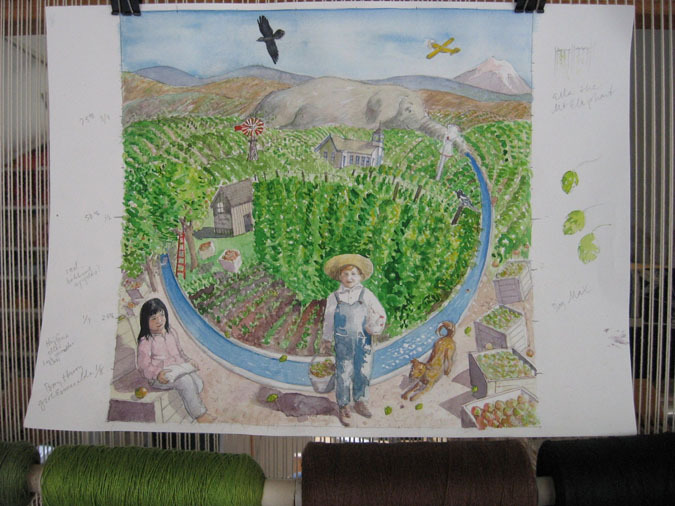 I include time for ordering and receiving warp and yarns, setting up the loom, creating the cartoon, and finishing the piece. Some clients are interested in receiving updates and images of the work on the loom, and appreciate being invited to visit the studio. This makes for a richer and more valuable experience for them. The client will want to make sure you can actually produce what you promise. They are investing in you and your vision, so when you present a proposal, the final product can’t be too different. 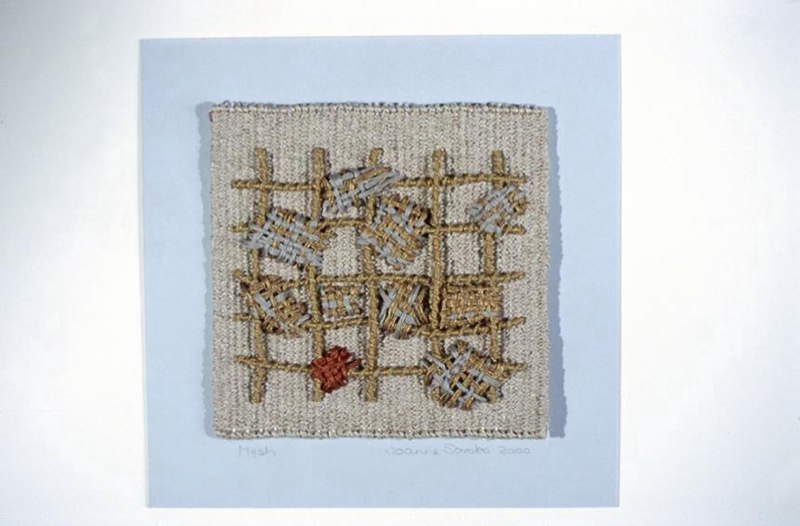 In essence, you must translate your proposal into tapestry. The tapestry is always richer and more interesting to look at than the watercolor sketch, but I try my best to capture my initial intention. My initial sketch for the Moxee project was just that, sketchy, and, as I weave the tapestry, I find that some elements have to be firmed up without losing the sketchy feel. After all, this is not a photograph. So my challenge this time (I always have to make it challenging to myself!) is to keep the watercolor feel and yet to be accurate when it comes to certain details. For example, the apples in the sketch became large gray blobs in the enlarged cartoon. I have to turn them into round apples as I weave, i.e., paint with yarn. How about payment? I think the approach used by WSAC works well and have used it as a model in other commissions. 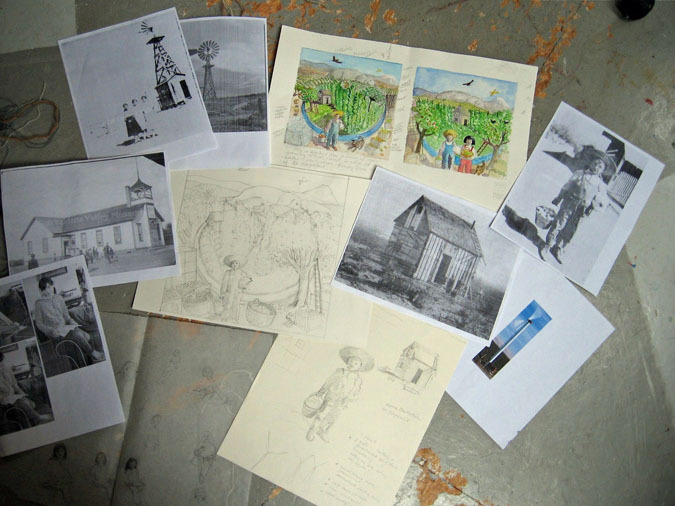 WSAC pays a fee for the artist’s proposal once the presentation to the client has been completed. 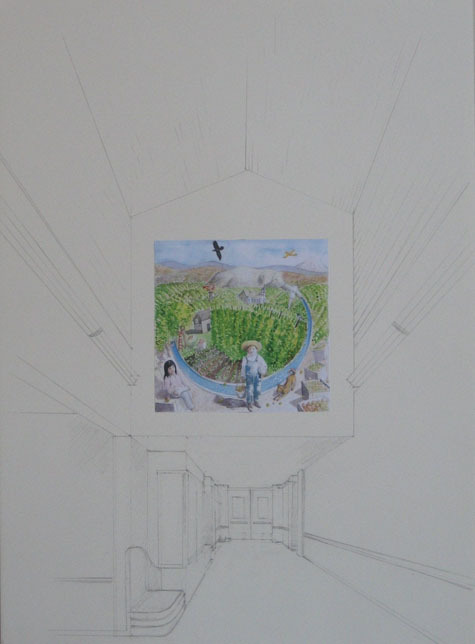 Payment for the creation of the artwork is divided into three parts: one-third after the design has been approved and the contract is signed; one-third mid-way through the project, as evidenced by submitted images and/or a studio visit; and one-third at the finish. The final payment is actually divided up so that part is paid at completion of the artwork and a smaller part is paid after the work is installed on the site. 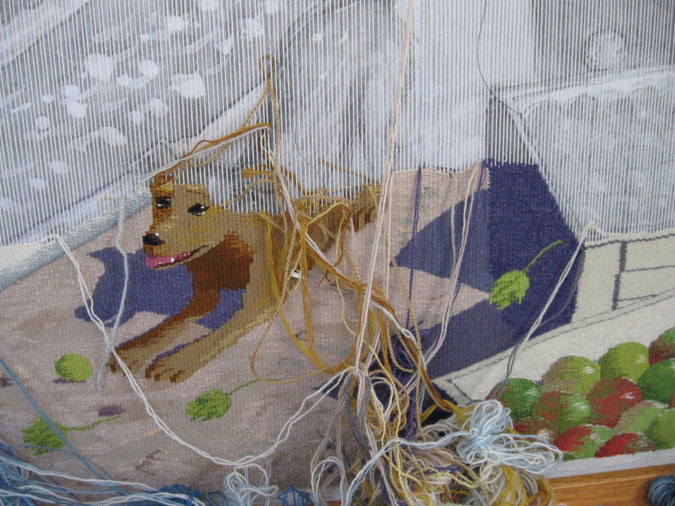 After I have completed the tapestry and attached Velcro or a bar and channel for hanging, I write pertinent information on a piece of cotton cloth and attach it to the back of the tapestry. 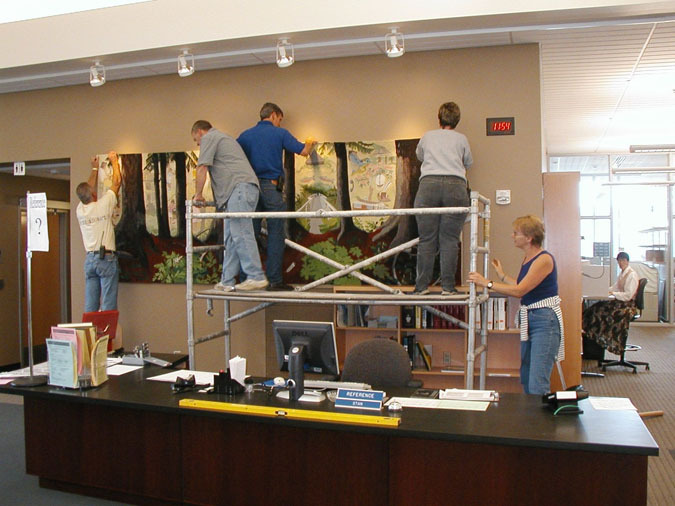 In some cases I do the mounting and hanging of the tapestry, but often there are in-house maintenance personnel to do the drilling into the walls, under my guidance. In the case of the current project at Moxee, I will be on a lift and will be operating the drill. Because of the risks involved, I was required under the terms of the WSAC contract to take out an insurance policy that includes liability for $1,000,000. The issue of lighting is a tricky one, as artists are often not involved early enough in the planning stages of the building, and the lighting for art seems to be an afterthought, at best. If you do have a say, take advantage of it, as the lighting is crucial. There are professionals specializing in lighting art works, and they should be involved at an early stage, if possible. A public presentation and photos for the WSAC files are also part of the process. I take lots of photos of the site, the process and the finished, installed work for my own records, as well. 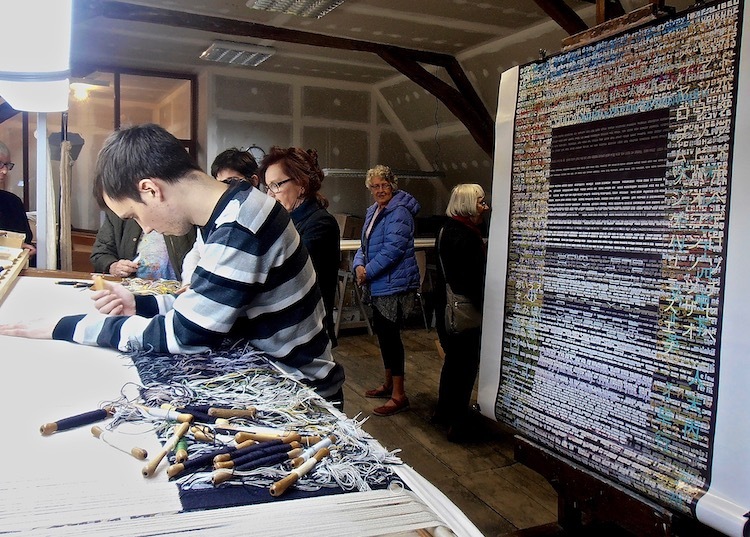 During the weaving of the project for Moxee Elementary School, I have been taking digital photos from the same spot in my studio, the thought being that it will be a sort of time-lapse record of the creation of the tapestry from start to finish. This series of images can then be used at the school, at WSAC, and by me as well. I enjoy working on commissions, as I become very focused and I spend more hours in the studio. With each project I end up learning about a region with its local tales and history. Each project is like a jigsaw puzzle, rich in detail, and I get very excited about it.